This hand mixer includes the features you need, plus some extras—and a clip-on case to hold everything for storage. The powerful motor operates with a simple on/off switch and a one-touch speed control lets you select one of the nine speeds. This comes with two extra-long beaters, one whisk, two dough hooks, and a spatula that all store in a clip-on case that you can also tuck the cord into. Rather than a button to release the beaters, this has a latch, so you’re less likely to accidentally release the beaters. While this has a slow-start function, reviewers have said that it’s not quite as slow as some other brands with the same feature. Still, it’s slower than a full-power start. If you’re looking for a faster, easier way to mix cake batter, whip cream, and mix soft doughs, but you don’t want to spend a lot for functions you’ll never use, this mixer fills the bill. It’s got an ergonomic design and wire beaters that make fast work of soft mixtures. This is lightweight, so it’s not tiring to hold and it has five speeds, so you can start slow and work your way up to a faster speed for whipping or beating. The power boost button increases the power until you release it, so you can power through lumps and then continue mixing at the original speed. The beaters are dishwasher safe for easy cleanup. While this can handle softer mixes, it doesn’t have the power to handle bread doughs or other super-dense mixes. It includes one set of wire beaters. Appliances are getting smarter, like this hand mixer that detects the attachment and adjusts the speed to the best range for that particular style of mixing. It offers higher torque at lower speeds and nine speeds so you can start slow and work your way up. The scraper beaters are coated so you can beat right against the side of the bowl with less noise. There’s a count-up timer so you can keep track of the mixing time for recipes that require a specific mixing length. A mixing light makes it easier to see what’s in the bowl, and a power boost button lets you momentarily increase the speed to get past a lump in the batter, then resume mixing at normal speed. A pause button lets you stop mixing momentarily so you can add ingredients. This comes with two scraper beaters, two dough hooks for denser doughs, and two balloon whisks for whipping cream or making other light, fluffy mixtures. All the parts store in a case that clips onto the bottom of the mixer, and the cord tucks in there as well. If your needs are modest, but you can afford to spend a little extra, this mid-priced mixer has plenty of features. It has ten speeds (operated with a simple slide) and a turbo-boost feature for extra power when you need it. The beaters are coated with silicone so you can mix right against the side of the bowl with less noise and clatter. A slow start helps keep ingredients from flying out of the bowl. This has a count-up timer so you can keep track of mixing time. A pause function stops the mixer and the timer, so you stop and add ingredients and still keep proper track of the mixing duration. 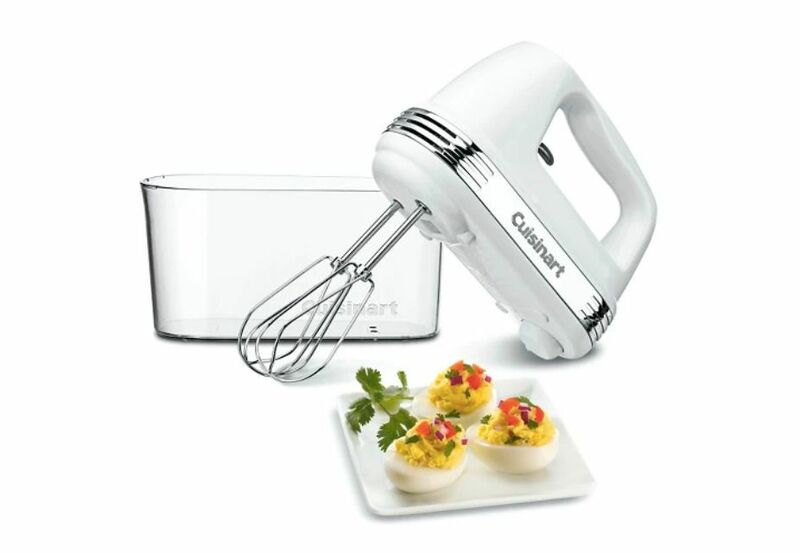 This mixer comes with two silicone-coated beaters, two dough hooks, and a whisk. A snap-on case lets you store the accessories neatly. This brightly colored hand mixer will help you whip up delicious desserts in no time at all. It has six different speeds, including a pulse function and a burst function that delivers 290 watts of power. This hand mixer also comes with six attachments, including a whisk, dough hooks, wire beaters, and a milkshake mixer. The convenient snap-on storage case keeps all of the attachments together so they won't get lost or damaged. Designed to be both comfortable and functional, each mixer boasts an ergonomic grip that won't leave your hand feeling tired or stiff. It weighs just over three pounds, so it's not terribly heavy either. Plus, it has a bonus feature that lets the mixer rest on the edge of the bowl, which will eliminate messy drips that tend to happen when baking. Available in four different colors. If you’re looking for a mixer that does more than just mix, this has a few extras that make it a little handier than the average mixer. It has nine speeds from a super-slow speed for stirring in ingredients all the way up to a high speed for whipping cream or making a fluffy meringue. 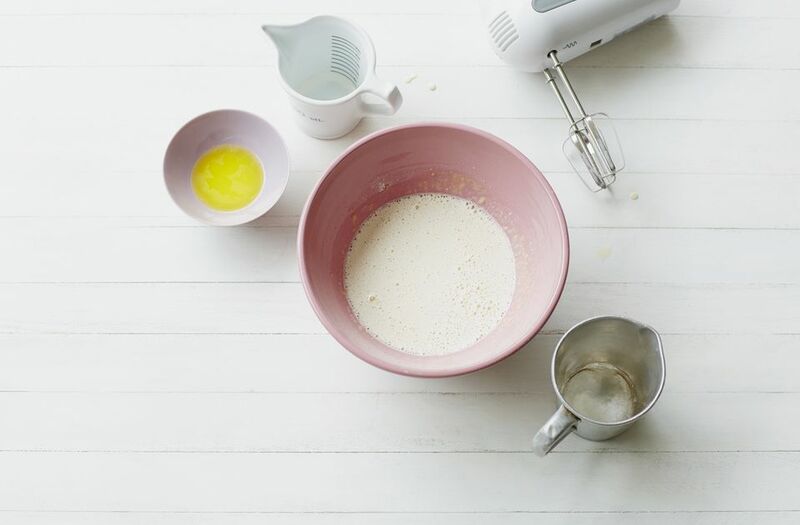 The soft-start means that even if you choose a high speed, the mixer will start slow and build up, so you won’t fling ingredients out of the bowl. The cord locks into place on the left or right side of the mixer to keep it out of the way, no matter which way you face or where your outlets are. This include two turbo beaters, a stainless steel whisk, two stainless steel dough hooks, and a blending rod so you can use this like an immersion blender. It also includes a storage bag so you can keep all the parts neatly together when it’s not in use. Available in five different colors that you can use to match or accent your kitchen.